An unintended effect: the demise of the Westboro Baptist Church will make life more difficult for this man, who earns his living making witty retorts to hate speech in the form of ironic counter-signs. TOPEKA, Kansas -- Fred Phelps, leader and founder of Westboro Baptist Church, announced at a press conference Friday that he was disbanding the church after actually reading the rest of the Bible. Phelps went on to detail how his personal worldview — which had previously been informed by a very literal and unflinching reading of Leviticus 18:22 — was impacted by reading the Bible’s 7,958 other verses. 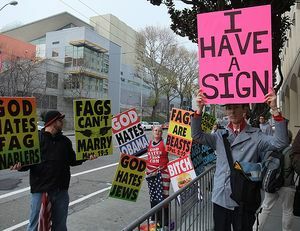 “The Bible also says nothing — nothing — about making hateful picket signs,” continued Phelps. The reverend and disbarred attorney was similarly taken aback by things the Bible did say. In light of his discoveries, Phelps decided to disband the Westboro Baptist Church. The decision, he said, was not popular with many of his family members. “My lovely daughter Shirley called me a fag-enabling sophist liberal, which was hurtful, while my son Timothy had the gall to call me literate,” Phelps said. With the demise of the Westboro Baptist Church confirmed, Phelps wrapped up the press conference by explaining his plans for a future organization. This page was last edited on 5 June 2012, at 05:53.